Object's 'Scale By' property can be changed on the 'Format' context ribbon category. Object's 'Width, Height and Depth' properties can be changed using the grow and shrink ribbon tools. Values for the object's 'Width, Height and Depth' can also be changed from the ribbon. One of 8 mouse grabber points situated around the edge of the selected object for scaling by mouse. Object's 'Scale By', 'Scale X %', 'Scale Y %' and 'Scale Z %' properties are also available within the 'General Properties' window. The Scale By property determines how the object is stretched using the different scale percentage properties. Mesh Shape - The object is as large as possible while maintaining the mesh' original proportions. Screen - The object is stretched proportionally along each axis to fill the screen. Screen Width - The object stretched to fill the screens width while maintaining the mesh' original proportions. Screen Height - The object stretched to fill the screens height while maintaining the mesh' original proportions. Screen Depth - Depth is scaled the same a 'Screen Width'. Screen Rotated - Similar to scale by 'Screen', but with the object's width is scaled in proportion to the screen's height and object's height in proportion to the screen's width. Within the 'Format' ribbon context category. Click the 'Scale By' drop-down selection box that currently shows 'Mesh Shape' and select 'Screen'. As the Scale X % and Scale Y % properties was set to 100%, the square object has been stretched to fit perfectly within the screen area. I.e. It has been stretched to 100% of the screen's width and 100% of the screen's height, turning the square into a rectangle. Ensure that the 'General Properties' window is selected. Click the 'Scale By' property to show it as a drop-down selection control. Change its value to 'Screen Width'. As the Scale X % and Scale Y % properties was set to 100%, the square object has been stretched in both directions based on the screen's width. This results in the object fitting perfectly width-ways with the screen, but as the object has remained as a square and the screen is wider than taller, the object now overhangs the top and bottom of the screen. The easiest way to scale an object is to use the mouse with one of the selected object's 8 resize grabber icons. To change both the object's height and width, use a corner grabber; alternatively just an object's height or width can be changed using a side grabber. 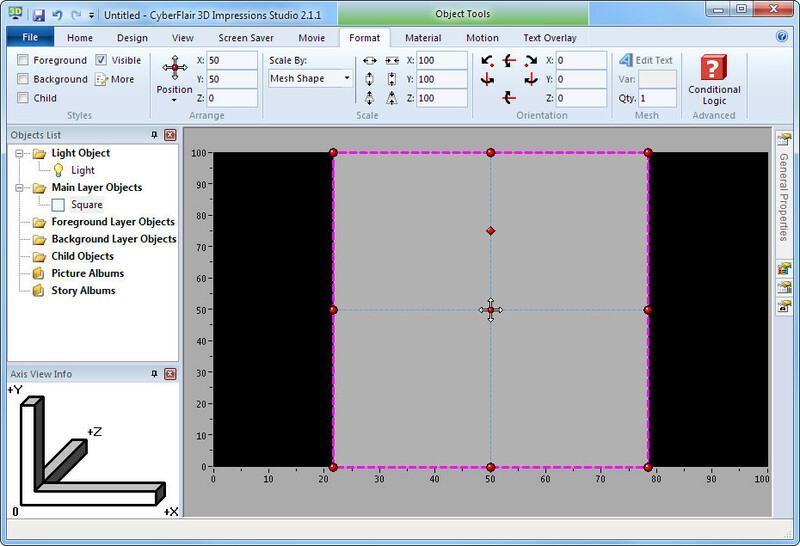 So that 3D objects are not distorted, when changing a 3D object's width, its depth is also changed proportionally. By default, values are snapped to the nearest 1% value. To prevent this 'snap-to-grid', hold down the Ctrl key. When resizing from the corner, if you wish to maintain the object's aspect ratio, hold down the Shift key. Ctrl + ← to shrink the object's width. Ctrl + → to grow the object's width. Ctrl + ↑ to shrink the object's height. Ctrl + ↓ to grow the object's height. Click each of the resizing buttons to perform the following actions, (as described left to right per row). Grow Width / Shrink Width Grow Height / Shrink Height Grow Depth / Shrink Depth. You can enter the scaling values either on the 'Format Ribbon' or the 'General Properties' window. The diagram below shows these locations once you have selected the object to be scaled. Ensure that the 'Format' ribbon category is selected. Enter the desired scaling values within the 'X:', 'Y:' and 'Z:' edit boxes. Note that these values are based on percentages of the screen dimensions, for more information see the 'General Properties' topic. Select the 'General Properties' tool window and enter the desired values within the 'Scale X %', 'Scale Y %' and 'Scale Z %' properties.